Finding a new and interesting location for wedding ring portraits can be a challenge, which is why we often like to divide and conquer toward the end of the reception: Steve takes on the dance floor after the main events while Em seeks interesting spots for photographing the rings, sometimes working details of the wedding into the shot and sometimes working with unique aspects of the venue or location. 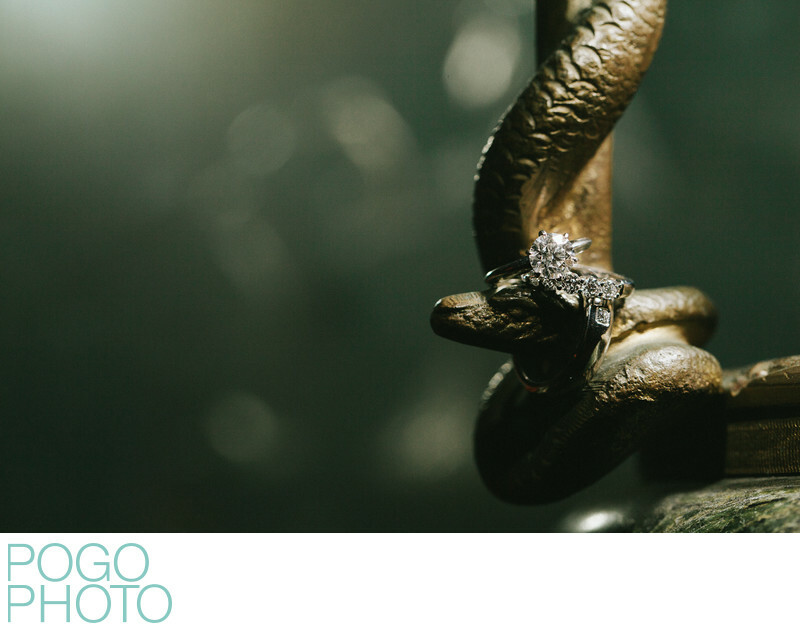 In this case the base of an antique brass lamp was a snake's head, making for a very unusual and dark ring portrait. Off camera flash and our mastery of how to control it creates depth and interest in this image, letting the background blur to obscurity while keeping the prongs of the diamond solitaire sharp and beautiful. The sinewy lines of the cast metal snake’s body create a sense of sensual mystery, bringing a sultry and slightly edgy element to a fairly straightforward detail photograph. Placing the bride’s solitaire ring and wedding band on top of the groom’s band adds a sense of feminine dominance to this image, isolating the beauty of the solo diamond while simultaneously allowing the “male stability” element to shine through, though subtly. We like to think of rings as representing their wearers symbolically, which can often be seen through the choice of style each person has in their own jewelry. Wedding bands are a perfect example of how stereotypical male/female strength tropes can be shattered, leading to a new understanding of how a couple must work together and find their own balance as a team. 1/200; f/5.6; ISO 500; 100.0 mm.